In the market for a new starting quarterback, Washington State coach Mike Leach will take the first steps Thursday toward discovering who’ll lead his huddles and throw his passes in 2019 when the Cougars opened spring practice Thursday. A reported injury to graduate transfer Gage Gubrud muddies the competition at the most important position on the field. 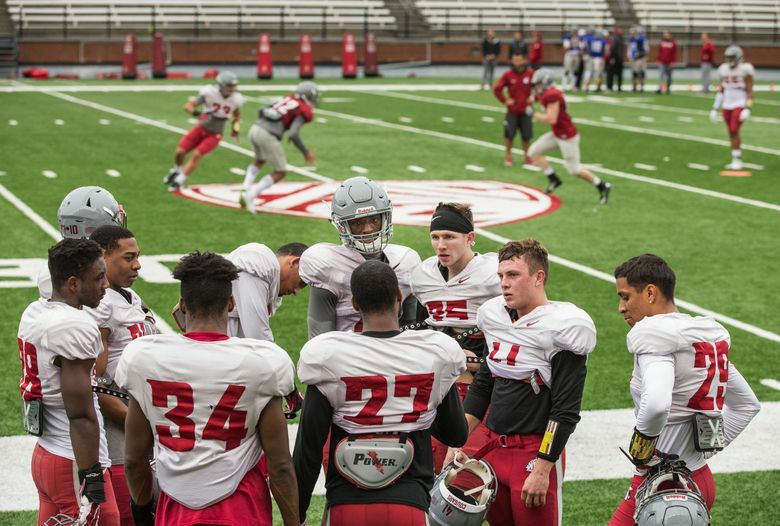 It’s unlikely these 13 practices in late March and early April will determine who’ll be under center when WSU welcomes New Mexico State for the Aug. 31 season opener. 1. Can Trey Tinsley, Anthony Gordon or someone else establish a lead at QB while Gubrud heals? The Eastern Washington graduate transfer is supposedly spending his spring on the mend due to what Cougfan.com reported – and The Spokesman-Review later confirmed – was an injury to his left foot or ankle, sustained during Midnight Maneuvers. The presumption is that Gubrud’s experience gives him a major edge in the quarterback competition, even if his time with Mike Leach’s Air Raid playbook – and WSU’s wide receivers – may be abbreviated. Gardner Minshew won the job despite the same handicap last year, but Gubrud’s challengers have the same window of opportunity they had last year before Minshew arrived in Pullman. Trey Tinsley and Anthony Gordon again are expected to make a push for the job. In December, Mike Leach said the redshirt seniors were still well ahead of redshirt freshman Cammon Cooper, but this spring will offer a glimpse of Cooper’s development between then and now, and also how freshman early enrollee Gunner Cruz has capitalized on his first few months on campus. “It’s similar to last year,” Leach said Wednesday during a precamp conference call. “We’ve got three guys with some experience or that have been around, so they’ll fight it out. Then split the reps up and we’ll take a peek at where the young guys are. Tinsley carries a thicker, more durable frame and was more of a vocal presence than Gordon was when both were taking first-team reps last fall. Gordon throws a tighter, stronger spiral and his ability to squeeze footballs through small windows is something Leach has praised time and time again. “When you consider Tinsley and Gordon, for example, Gardner beat them out by an eyelash last camp and I think we could’ve won with either one of them,” Leach said. “So there’s an emphasis on getting as many reps into those guys as we can. 2. Will the Cougars reconfigure their offensive line in an attempt to replace Andre Dillard? One way or another, WSU will have to locate a replacement for Andre Dillard, the left tackle who could be the most coveted offensive lineman in the upcoming NFL draft. It’s not quite as simple as filling a hole, though. The Cougars return four of five full-time starters on the line and another starting-caliber player in Robert Valencia. But Dillard and Abraham Lucas were the only tackles who started last year. One theory that’s been floated is the Cougars would move Lucas, the right tackle and top returning O-lineman, into Dillard’s role to better shield the quarterback’s blind side. Valencia probably won’t unseat either of WSU’s returning guards – Liam Ryan or Josh Watson, who he started for in the Alamo Bowl – but he has experience at right tackle and could be a natural replacement if Lucas shifts over to the other side of the line. 3. With all the depth at “X” and “Z,” will one of the outside wide receivers make a move inside? The Cougars return 208 receptions, 2,442 yards and 23 touchdowns from the “X” and “Z” outside receiver positions. Both Z’s, Dezmon Patmon and Easop Winston, are back, as are the X’s, Tay Martin and Calvin Jackson Jr. Kassidy Woods and Brandon Gray, receivers who stand at 6-4 and 6-5, respectively, are coming off redshirt seasons. Another wideout, Rodrick Fisher, is back in the mix after suffering a season-ending injury. Even in an offense that distributes the football as frequently – and as evenly – as the Air Raid, there won’t be room for more than four outside targets in Leach’s rotation. Kyle Sweet’s graduation means the Cougars have a vacancy at inside receiver, which could prompt Leach to move some pieces around. Jackson Jr. played in the slot briefly at Independence (Kansas) Community College and Winston, at 5-11, 190 pounds, has the body type that could allow him to play inside. 4. Just how good can Lamonte McDougle be at nose tackle? The best player on WSU’s defensive line this spring could be the one who didn’t record a single stat last fall. Now that his grace period is over, West Virginia transfer Lamonte McDougle will take his first meaningful reps in a crimson jersey and he’ll be the front-runner to replace Taylor Comfort at starting nose tackle. The former ESPN Freshman All-American supposedly left the Mountaineers because he wanted to find a scheme that would use him more as a pass-rusher, rather than someone who’d consume blockers to free up teammates. The 6-foot, 305-pound McDougle found that in Pullman. Even if the sample size is small, he’s already produced a few head-turning highlights during positional drills and team periods that would leave one to believe he could have a big impact – and an immediate one – in his first season with the Cougars. 5. What changes at inside linebacker without Peyton Pelluer and Ken Wilson? Two fixtures of the inside linebacker position over the last half-decade will be nowhere in sight when the Cougars begin spring workouts. Peyton Pelluer, the most capped player in program history, and his longtime position coach, Wilson, were only in Pullman for six years, although it felt like much longer than that. Pelluer’s pursuing his NFL dream and Wilson’s joined Mario Cristobal’s staff at Oregon, so for the first time since 2014, neither will be in the position room. Roc Bellantoni, who has almost 30 years of experience under his belt, steps into Wilson’s position and redshirt junior Jahad Woods becomes the team’s most experienced – and talented – inside linebacker. But whether Woods or someone else – Dillon Sherman or Justus Rogers, perhaps – assumes Pelluer’s leadership role is still to be determined.